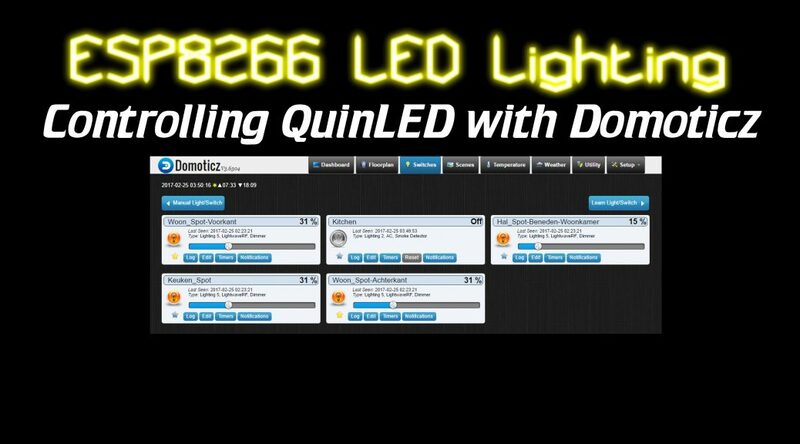 Today we’re going to take a look at using QuinLED with Domoticz. First I’ll take you along while we install Domoticz on a Fedora 25 Server and then we configure it work with QuinLED. Yes, you read that correctly, I’ve made 2 videos! The first video is about installing Domoticz itself, we go through downloading the newest source code from the GitHub and then compile it and make it run automatically during startup of the machine. The second video is about configuring Domoticz to be able to talk to QuinLED. For this part you need to have a Domoticz server running (Like we configured in part 1) and also have a QuinLED ready that has the correct code running and is connected to your WiFi (With the IP known). This will not be a writen tutorial also, if you’d rather read this in written form, please take a look at my original article I have about this here. During the video I copy & paste a lot of lines of code. Those are going to follow below. Keeping this post close-by should allow you to follow along with the video and basically replicate what I’m doing! Start with installing a Fedora 25 Server Edition (virtual) machine. During the install, you don’t need to select any packages or roles, just leave it a bare system. While it’s installing you have to set the root password and you also need to create a user, give that user administrator privileges too. After testing the connection (http://IP.IP.IP.IP:8080), you can stop Domoticz by hitting “ctrl-c” in the terminal window. And that’s it! Domoticz should be running and reachable using http://IP.IP.IP.IP:8080 and/or https://IP.IP.IP.IP:4433 ! As I mentioned above for this part you need to have Domoticz up and running and you need a QuinLED module which is connected to a LED light, WiFi and you know the IP. Make sure that while copy & pasting no lines get truncated (Like I had in the video)! Fill in the details for the “DomDevice” , “IP” and “LEDtarget” fields. If you have a question, please leave a comment here or at one of the YouTube videos and consider subscribing to my YouTube channel and giving the videos a like, that helps me out a lot! it works!! Now I can make the other 9 prints. …LUA script for Domoticz is different for Windows 10. Ai, sadly I have no experience running it on Windows. Maybe a Raspberry Pi would be a good cheap option for you? I just got my boards and put everything together. I’m trying to use COB lights that run at 16.5v. When connected to my desktop power supply they dim very well by just adjusting the voltage. My problem that is when using the dimmer at 1023 the max voltage I get is 12v which is the lowest amount of power to show any light. It seems to reach this 12v threshold at about 800. Is there a way to change the lowest level of dimming so that it will go higher? I am using the 2.6 board design with the resistors. I think you are facing a different problem. Most likely the MOSFETs you got are not 3.3v triggered but 5v. Using which link did you order them? Sometimes the Chinese suppliers decide to start sending a different model using the same link. You can test it by setting 3.3.v to the gate pin and then 5v to the gate pin of the MOSFET. If the light output changes and the light shines at the full intensity, that is your problem. Alternatively, you could try and set the on-board voltage regulator on the QuinLED module to a higher voltage. Most often the EPS8266 doesn’t immediately die at 4.5v or even 5v. It will definitely shorten the lifespan though if you run it like that for a long time so I don’t recommend that. Thanks so much for sharing all your work. Your pcb and insctructions are very clear! That’s cool! If you wrote any code for that, would you mind sharing it in a reply? I’m sure other users also use OpenHAB! Great – would love to see the code used for openhab? Do you have any idea how to keep QuinLED turned off after a power cycle? Thx Quindor! Love your work. Has anyone gotten the QuinLED working with Home Assistant, or any pointers on how I can go about dong this ? I would love to see Quinled working in Home Assistant too. Did you ever get this working in Home assistant? I am having another look at this really would like to get a dimmer slider working. hi, if I wanted to implement a manual on/off and dimmer?